This past week has been an interesting one. We finished out our trio of Elder Largo, Elder Newbold, and I. It was a lot of fun being in a trio but it made it harder to focus on the work. I learned a lot though nevertheless and we still managed to stay very productive. By the end of it all I felt like I had two good friends. Having to say goodbye to Elder Newbold was bitter sweet. I felt like we have become good friends after 3 months and we taught really well together, as a result I had come to trust him a lot. Though I am excited to mix things up, it has proven difficult to regain that trust. It will come though, of that I am sure. On Wednesday I got my new companion. His name is Elder Barcala. He is from Scottsdale, Arizona and he is a convert of 2 years. He is 22 and already has his bachelors in criminal justice from ASU. He has a terrific fire for the work and I hope that as his trainer that I can kindle that fire and help him become a very confident and powerful teacher. Wednesday night we went over to a members house for dinner and afterwards did splits with him and his brother. So day one I have my new companion going out on his own. He did pretty good actually. On Thursday the ward mission leader and his wife helped us out a ton by showing my companion around and helping get bikes. Being on bikes has been bitter sweet, while we drip in sweat biking in shirt and tie in the hot Florida sun it is easier to street contact when you are on bikes. It is far less intimidating to approach someone on bike than in a car. Also when we would drive slowly in a car down neighborhood streets it was hard to not think that we were the police. We have gotten into the groove now though and we are starting to build up our teaching pool again. We have been working hard and it is paying off. We are meeting a lot of good people and I just hope that in some small way that we make their day a little brighter with every visit. We were blessed to be able to catch Ben last night and we took him to the church to watch the CES fireside. Ben has been through a lot and is living in a terrible environment, but while we were watching the broadcast I could tell that a lot of the things hit him really powerfully, and I hope that he can put into action some of the incredible advice of Elder Russel M. Nelson. I was really grateful to be able to see it and it just made me so pumped that general conference in coming up. 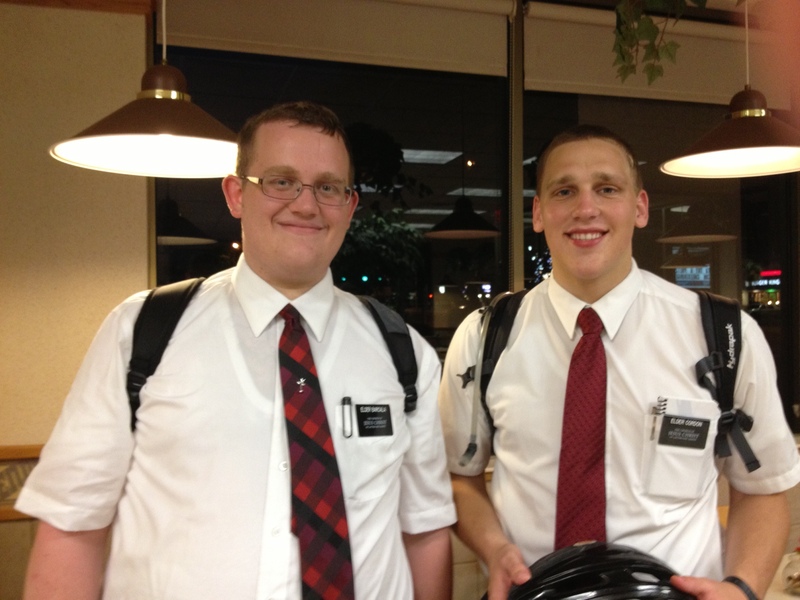 This entry was posted in Joshua and tagged biking, Biking in Florida, CES Fireside, Christ, Climbing a Mountain, Companions, disheartened, Divine Potential, Elder Cordon, Elder Russel M. Nelson, Florida, Friends, Hot, Jacksonville FL, Jesus, Jesus Christ, lds missionary, Missionary, Mormon, Progress, Spiritual climb, summit, tracting, Training, trio by shalesecordon9. Bookmark the permalink.